One of the challenges that municipal electric utilities face is recruiting, training, and retaining qualified lineworkers. 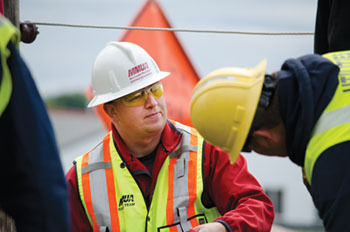 MMUA has developed a cost-effective and user-friendly program to help our members develop a raw, first-year apprentice into a fully qualified journeyman lineworker. This innovative, four-year program brings top-notch teaching and hands-on skill development to your system. The course allows the municipal utility employee who wants to advance in the lineworker’s trade to receive professional training from experienced instructors, right at the utility site. Students are given a cutting-edge academic program along with extensive hands-on training to help them progress to journeyman status. Program timing is flexible and training typically takes place one or two days a month. This training often involves actual projects on your distribution system. Students also attend several MMUA schools, tuition free. Students from any MMUA member utility can enter this program at any time during the year, so you have the flexibility to start your apprentices when the time is right for you and your employee. We have worked with newly-hired young people from the member community, as well as well-established employees from various city departments. Use this program to grow your own outstanding municipal lineworker. Here is a print brochure. Or contact Rita Kelly at 763.746.0707 about this program. MMUA’s Safety Management Program is nationally recognized as an innovative model for providing intensive, effective, safety management services to communities large and small. Our system offers a consistent and comprehensive safety program for all city departments. The program emphasizes the development of a safety culture and includes monthly employee safety training, development of a functioning and effective safety committee, safety audits/mock OSHA inspections, safety grant application mentorship, and standardized record-keeping. Our safety manual system is customized for each location. Our coordinators work with crews on job sites, perform on-site safety audits, conduct accident investigations and provide OSHA inspection support. Please contact Rita Kelly at 763.746.0707 about this program. The JTS program is the longest running training program offered by MMUA. The program is primarily focused on technical training to reflect the duties of the lineworker, engineering, metering and other operational departments within the municipal electric utility. The program is designed to help both new and established employees become more proficient at their jobs. The MMUA Job Training and Safety staff regularly updates the curriculum to reflect the needs of member utilities. MMUA has truly taken this program to the next level of instruction. MMUA’s Safety Team pledges to deliver timely and accurate training to do the job safely, efficiently and in compliance with relevant state and federal safety and health standards and regulations. The MMUA gas circuit rider program provides specialized support for municipal gas utilities. This service includes both operator technical training and regulatory compliance assistance, and has proven to be very helpful and popular for the gas utility member. The MMUA Natural Gas Circuit Rider works to ensure your natural gas system operators meet all mandated requirements, including ‘Operator Qualification,' Public Awareness plans, and the Gas Distribution Integrity Management Plan (DIMP). MMUA helps your staff put this program together. In addition, the Pipeline Safety Improvement Act of 2002 requires each gas utility to evaluate the effectiveness of its public awareness programs and make improvements where necessary. To help our members comply with these requirements, we also help develop your public awareness plan. It is not enough to simply meet mandates and have properly trained personnel ? a utility must also keep detailed and proper records. MMUA works with your staff to ensure regulatory compliance, including record keeping and tracking regulatory changes. We are in regular communication with Minnesota Office of Pipeline Safety (MnOPS) personnel and assist the member with annual MnOPS inspections. This program pays attention to detail, but also manages to be wide-ranging and flexible, with the ability to address a variety of needs. To assure safety in the transport of hazardous gases and liquids in the nation's pipelines, pipeline operators who perform covered tasks must be qualified. Qualified means that an individual has been evaluated and can perform assigned covered tasks and recognize and react to abnormal operating conditions. The Operator Qualification (OQ) Program stems from a mandate in 1992. It has been updated periodically and continues through present Pipeline Safety Acts. Regulations include specific areas, such as operating and maintenance tasks. MMUA staff is up-to-date on protocol questions and regulatory expectations. We have a clear understanding of the issues and help support evaluation of the OQ management processes used by the operators to comply with the performance-based provisions of the rules. 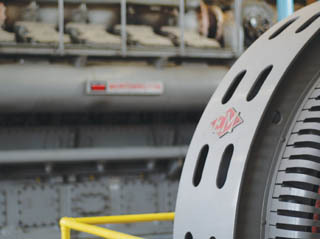 MMUA’s expert staff knows the OQ program from every angle: as former pipeline operation personnel, as compliance specialists, and through a close working relationship with Minnesota Office of Pipeline Safety personnel. We train, help the member comply, and participate as a trusted partner in inspections involving the member utility and regulatory agencies. Small cities often struggle to meet training and other requirements of the state and federal Occupational Safety and Health Administration (OSHA). 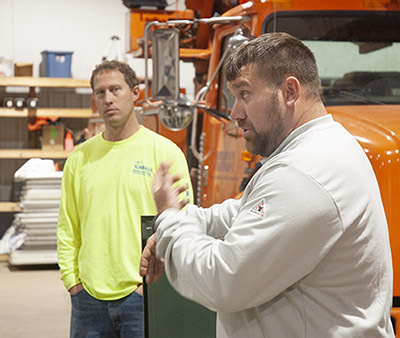 Regional safety groups are a flexible way for small members of the LMCIT workers compensation program to meet state and federal mandates, under the guidance of MMUA staff. The LMCIT partners with MMUA to deliver the Regional Safety Group (RSG) option to members of its Workers’ Compensation program. With an RSG, neighboring cities come together as partners in OSHA compliance. LMCIT helps coordinate the RSGs and covers a portion of the training costs for each one. This MMUA-LMCIT partnership is well into its second decade of providing this very popular and important service. MMUA helps the small cities establish a working safety committee and delivers appropriate generalized safety training to the group throughout the year. MMUA and the League of Minnesota Cities Insurance Trust (LMCIT) have established a partnership to provide safety services to an expanding group of cities through the LMCIT Regional Safety Group program. MMUA provides regular safety and training services for groups of cities through this program. MMUA also provides On-site, On-demand training, performs safety audits and inspections, and provides one-on-one consulting. The partnership has also expanded to development of operations and maintenance manuals for electric generation plants. The League of Minnesota Cities Insurance Trust (LMCIT) provides coverage for municipal electric generation facilities, each with unique risks. LMCIT has partnered with MMUA to put in place customized guidelines that keep utility staff, the facility and community more safe. The MMUA staff expert works with utility staff to develop written preventive maintenance schedules and documented operating procedures. An up-to-date written preventive maintenance schedule, including a comprehensive inventory of critical equipment, qualifies a utility for a 10 percent rate reduction on their property coverage rates. It is no longer common to find municipal utility personnel dedicated solely to electric generation. The O&M project has greatly helped many utilities better understand the critical environment of the generation station and equipment. 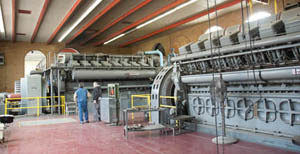 This process will help with the maintenance and operation of public power generation facilities for many years to come. This program helps you save money on equipment replacement cost and maintain a staff of skilled, confident and safe equipment operators. This program is another partnership between the League of Minnesota Cities Insurance Trust (LMCIT) and MMUA. This program follows from the O&M program and involves an annual audit of your electric generating plant, through the LMCIT, conducted by an MMUA staff expert. The audit also provides an opportunity for your staff to discuss a variety of generation-related issues with MMUA staff. Members of the MMUA OQ Program can click the logo to visit the EnergyU website.